Below: Havering Conservatives withdraw "dog whistle" campaign leaflet; infighting in Wandsworth Labour; Redbridge councillor investigated over planning committee interference; Javid updates councils on Local Plan intervention. 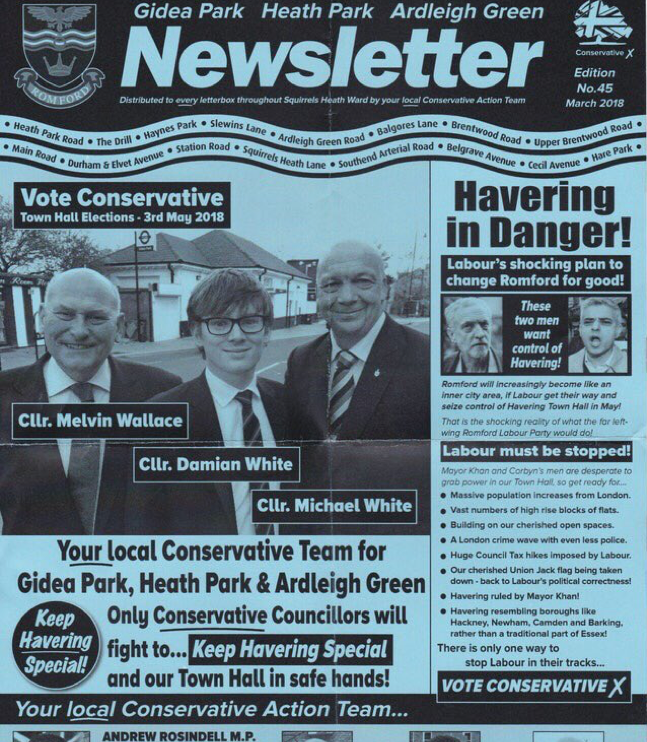 Havering Conservatives’ first election leaflet came in for strong criticism this week, with controversy building until the story hit national newspapers and the leaflet was ordered to be withdrawn by the central party. With the commitment to “Keep Havering Special”, the leaflet warns that Sadiq Khan’s plans for control of the borough would leave Havering “resembling boroughs like Newham, Camden, Hackney and Barking, rather than a traditional part of Essex”. This drew widespread online accusations of “dog whistle” racial politics, and even Conservative MP Nick Boles came out against the leaflet. Havering Deputy Leader Cllr White said the leaflet was originally cleared by Conservative HQ with no comments, and he stood by its content. Wandsworth Labour may be confident of taking control in the borough, but the Evening Standard revealed internal battles that may take centre stage after 3 May. In a leaked recording, local members of the left-wing Labour group Momentum are heard calling for a challenge to Labour leader in Wandsworth, Cllr Simon Hogg, saying, “I’m not convinced that I want this particular Labour group with these particular candidates to be running Wandsworth.” Cllr Hogg’s response was to tell the Standard that the recording represented only a small minority, and “Labour are united to win Wandsworth and end 40 years of Conservative rule”. One councillor in nearby Westminster thought the coverage would prove beneficial for Wandsworth Labour as it proves moderates are in charge there. As Purdah began across London, it was revealed that Redbridge Labour chief whip Cllr Roy Emmett is under investigation for allegedly putting undue pressure on the then Chairman of the Planning Committee in 2015. In an email, Cllr Emmott asked his colleague to "do your best", given that the applicant for a community centre on New North Road had supported Labour candidates in the past and now wanted support from Labour members. Redbridge Conservative group called for Cllr Emmott to stand down in May, but the Labour council leader Jas Athwal promised a "full investigation" and said he was confident Cllr Emmott would be cleared. - Stephen Bush of the New Statesman considered what a “good night” would look like for theLib Dems on 3 May. The party lost 310 councillors and control of two councils at the 2014 local elections, but Bush claims this is of little use for judging its performance. 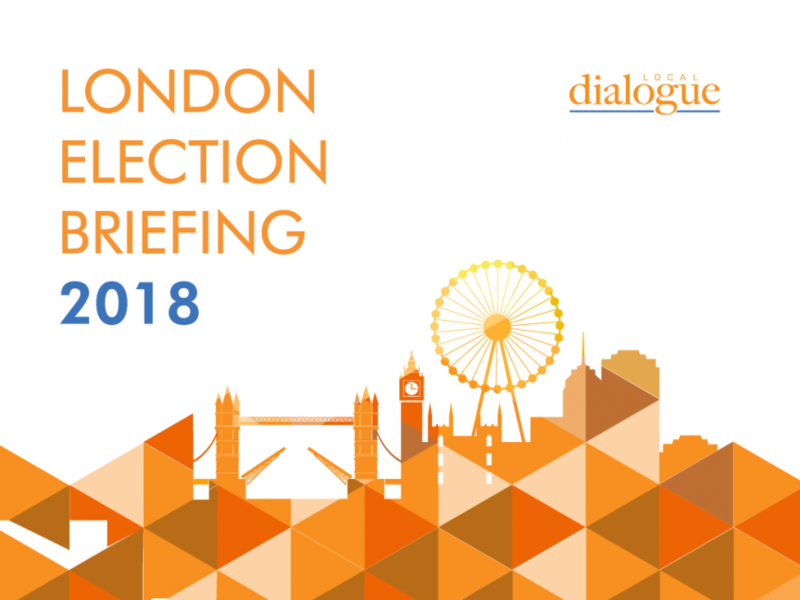 On a good night, the Lib Dems would retake Kinston-Upon-Thames and Richmond councils, and retain their presence in the Labour-dominated areas like Manchester, Leeds, Southwark, and Hackney. The Party should also be able to deprive Labour of its majority on Cambridge Council, though retaining the Watford mayoralty would be “an exceptional result”, given the incumbent Lib Dem Dorothy Thornhill is stepping down. - In the wake of increasing pressure heaped on Labour Leader Jeremy Corbyn over supportive Facebook comments he made over the removal of an anti-semitic mural in 2012, Barnet Labour opposition leader Barry Rawlings called for him to be more explicit in his condemnation of anti-semitism in the Labour Party, which he called a "blind-spot" for Mr Corbyn. Barnet is tantalisingly poised for the May elections, with the Tories running the borough with a majority of one for the last few years. Labour expect to take control, but with the highest proportion of Jewish voters in the capital, the electoral effect of recent Labour anti-semitism claims is likely to be greatest in Barnet. - Secretary of State for Local Government Sajid Javid has written to 15 local authorities to update them on the status of government intervention over their failure to produce a Local Plan. Liverpool, North East Derbyshire, Runnymede, and York have recently published Local Plans and so are no longer subject to government intervention. On the other hand, the government's Chief Planner will be sent in to Castle Point, Thanet, and Wirral to produce a Local Plan. - And finally...Mr Javid was himself the cause of some controversy this week when he referred to Momentum as "hard left neo-fascists" in Parliament during a debate on local government cuts. Momentum replied on Twitter that were he to repeat the remarks without the cover of Parliamentary Privilege, the organisation would take legal action.